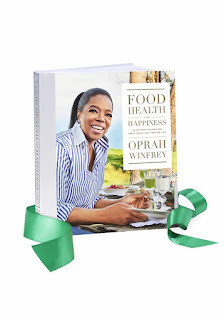 It's time again for my holiday gift list for foodies, during this most sacred time of the year, when all shopping is permissible and no one can fault you for going overboard! 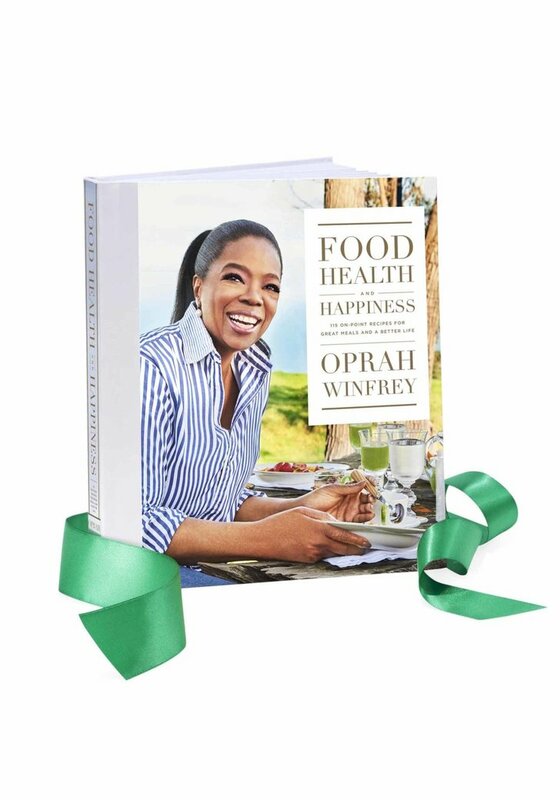 First up is Oprah's Weight Watchers cookbook, Food, Health and Happiness. I received this as a gift from my friend Melanie this year, and have very much enjoyed its light, yet flavorful recipes for Vietnamese chicken salad, cacao e pepe pasta, and miso glazed cod. 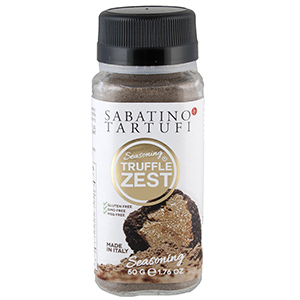 Next up, one of Oprah's suggestions for adding rich flavor to lightened up dishes is Sabatino Truffle Zest, a $15 indulgence that makes a great stocking stuffer, and is head and shoulders above truffle oil at adding the earthy, heady truffle flavor to foods without completely taking over all other flavors like oil does. 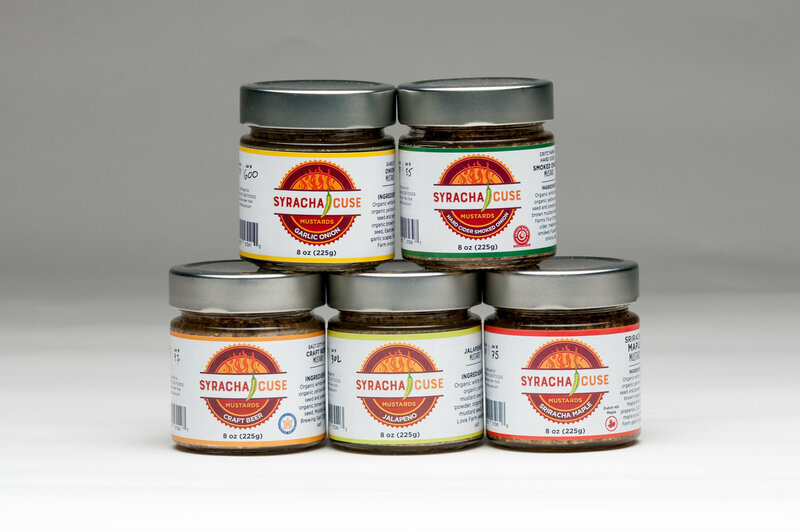 It's intense and delicious on pastas, eggs, and potatoes, or to enrich a mushroom dish. 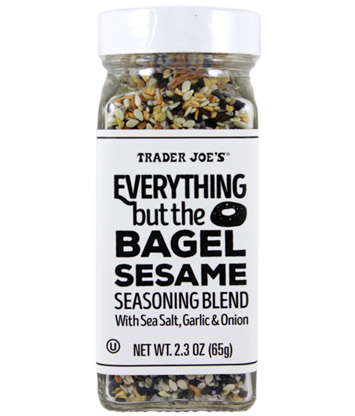 Staying on the spice track, you absolutely should buy everyone you know a jar of Trader Joe's Everything But the Bagel seasoning blend. 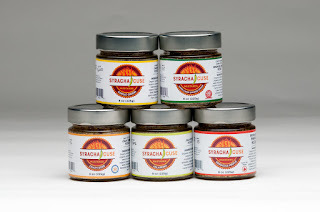 This one's even more affordable, just $1.99, and makes everything you sprinkle it on sing with the onion, garlic, sesame and poppy seed goodness of an everything bagel. Basically, buy this for people you want to like you more, because they totally will. I like to brush boring old frozen dinner rolls with a little butter and then sprinkle it on before I bake them, to add zest. Also delicious on an omelet, especially if you're doing a low carb diet thing and are missing your morning bagel. "But Shelbs!" you're whining, "I need more than stocking stuffers!" Duh, I know. And I got you. Shawn bought me my Philips Air Fryer last year for Christmas, and it has become our favorite appliance. Want chicken wings you can make at home, less greasy than bar food, but more crispy, and with no oil to dispose of or stink to endure? Air fryer. Want actually healthy French fries, crisp on the outside and fluffy on the inside? Air fryer. Want crunchy empanadas without the guilt? 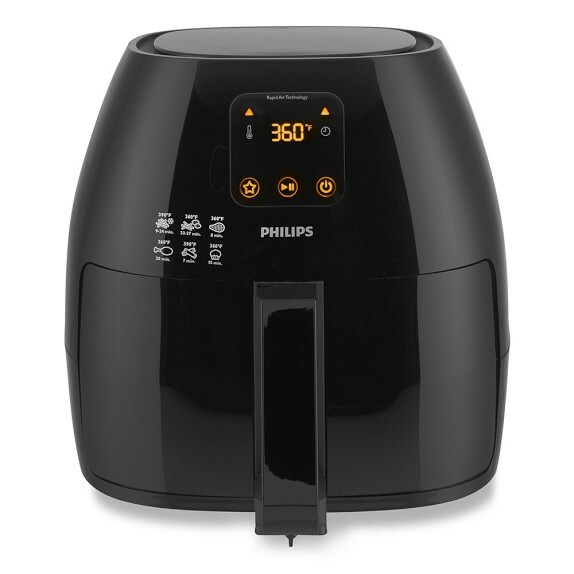 Air fryer! It's bulky, yes, but we use it almost weekly, and deeply love the degree to which it's kept excess oil out of our diets this year, while still delivering crunchy, crispy food to our bellies. 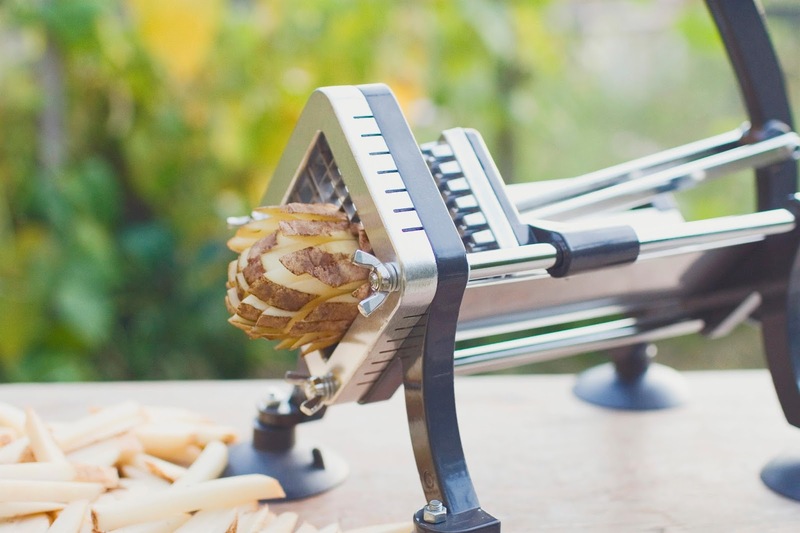 If you get your loved one the air fryer, you might as well go ahead and get a French fry cutter. Believe me, once you taste how great fries are out of this baby, you're going to want to make them all the time, and cutting uniform fries by hand is a pain. We have this heavy duty French fry cutter. It's boss hog. A little unwieldy on the counter-top. I suggest mounting it so you can be a true fry professional in 2018. For my birthday this year, I received a box of New York State treats from Shawn's family, and this next gift idea was my favorite of the bunch. Hedonist Artisan Chocolates is a Rochester-based business, and its ginger truffle and pistachio truffle were two of the best things I put in my mouth all year. 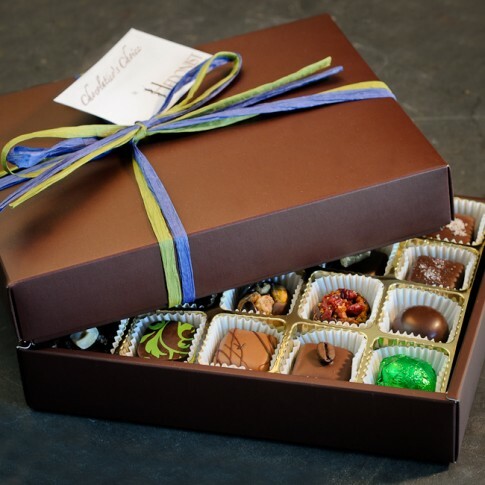 The Chocolatier's Choice box is $34, just about what you planned to spend on your mother-in-law, no? So that's my deal this year, you guys. Really great gifts, one and all. You could do all the foodstuffs together as one basket of goodies, or package the fryer, cutter, and truffle zest as a truffle fry bundle, or even the chocolates and cookbook together as a "Naughty Holiday, Healthy New Year," idea! No matter which gifts you choose for those you love this year, make sure it has flavor, and remember, gift certificates to locally owned restaurants never spoil. Love and joy to all of you Hungries! Happy Shopping! Since the terrible events at Mandalay Bay last month, visiting Sin City has seemed a bit taboo. Hopefully, our leaders in Washington will get off their butts and legislate some common sense steps to limit the availability of weapons of mass destruction to mentally ill people. And maybe, just maybe, we can also have a national discussion on how best to increase mental healthcare in this country so that those individuals can be diagnosed and treated before anything like this ever takes root in their minds. I visited Vegas the week after the shooting, and the mood of the town was somber. 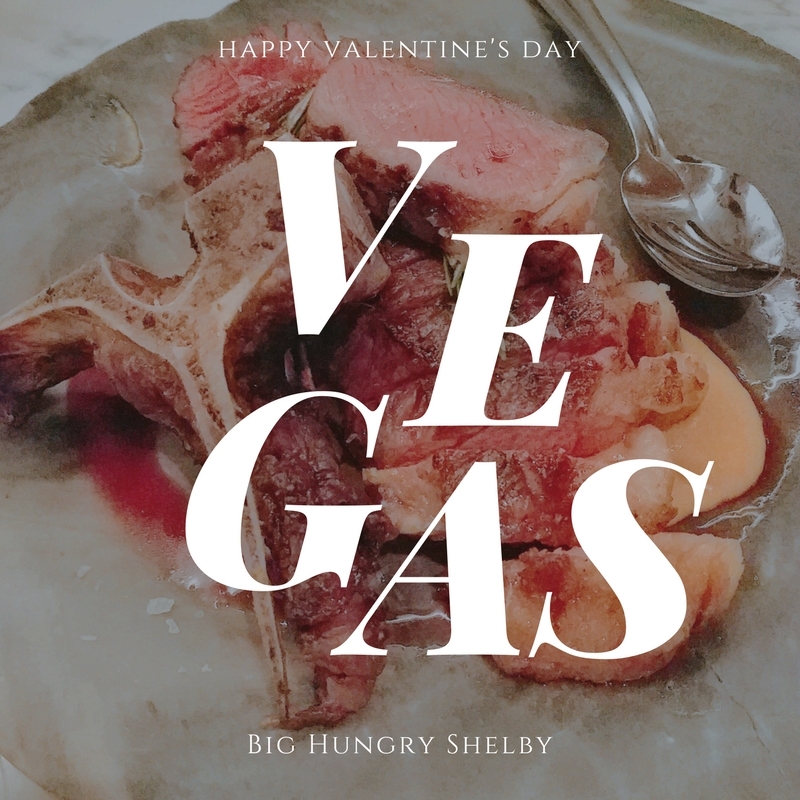 It seemed less busy than usual, which was sad, but ultimately positive for a girl looking for easy and last-minute tables at restaurants on The Strip. This was a short trip, with work at the convention center during the day, but I hit a few places you should know about. B and B Ristorante, in the Venetian, is another stop in the Batali empire of fantastic restaurants. They started us off with a delightful amuse bouche of spiced chickpea bruschetta, but then proceeded to try to upsell every single course thereafter – a tendency I noticed during a couple dinners this trip. This ball of truffled butrratta wasn’t my favorite bite of the night. 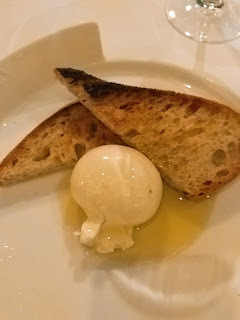 It was less creamy than most handmade burrattas, and relied more on the gracious splash of olive oil over the dish for flavor than any of its own merits. 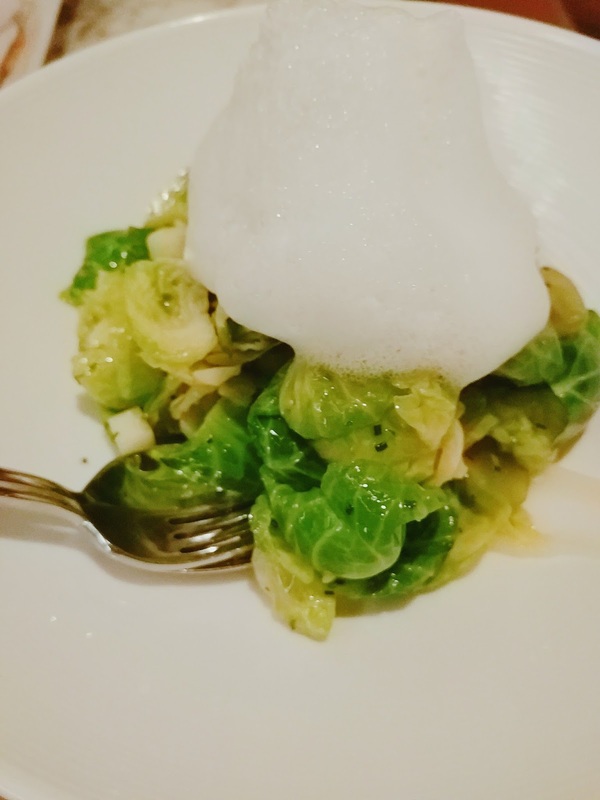 But these brussels sprouts were delicious. 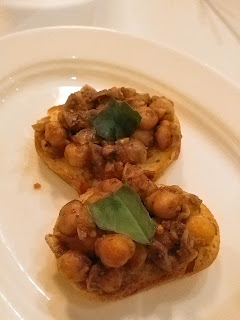 Caramelized and flavored with lardon and lemon zest – they were crisp-tender, and perfectly seasoned. 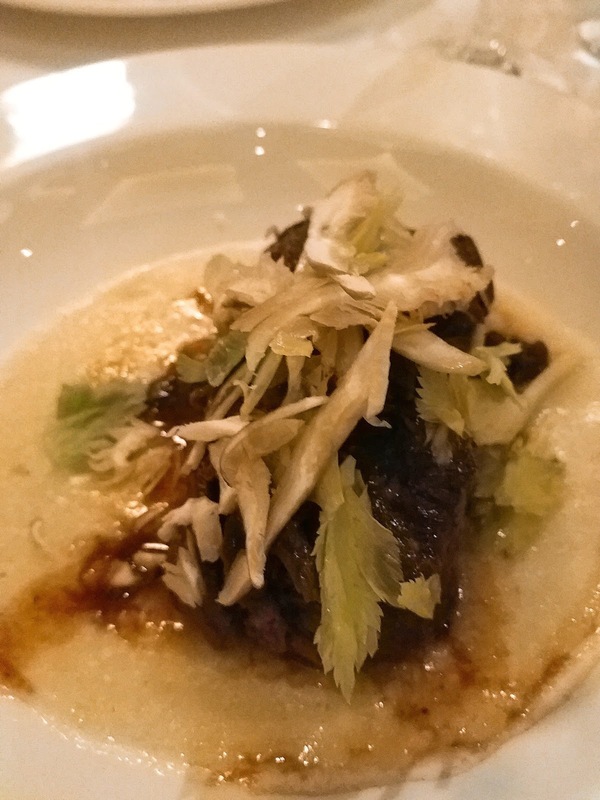 The short rib entrée, served with creamy Anson Mills grits and Barolo wine sauce, was delectable. 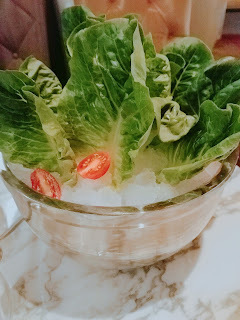 I loved the fresh horseradish and celery leaf salad over the top, which brightened up the deep, earthy flavors of the wine sauce measurably. 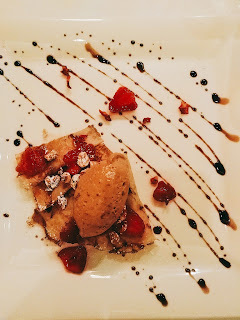 Nutella ricotta crespelle cake was the Italian version of crepes with Nutella and strawberries, except the crepes were crispier, and the Nutella was delivered in a perfect quenelle, whipped with ricotta cheese. Fried hazelnuts over top added crunch, and the mix of both fresh and dried barriers sprinkled over the plate provided nice, sweet contrast. The service at B and B was impeccable and undeniably fine-dining level, but honestly, it was a touch overbearing. There’s a fine line between fussed over, and being hounded by a man who insists on reading you the entire menu. I prefer not to have that crossed. 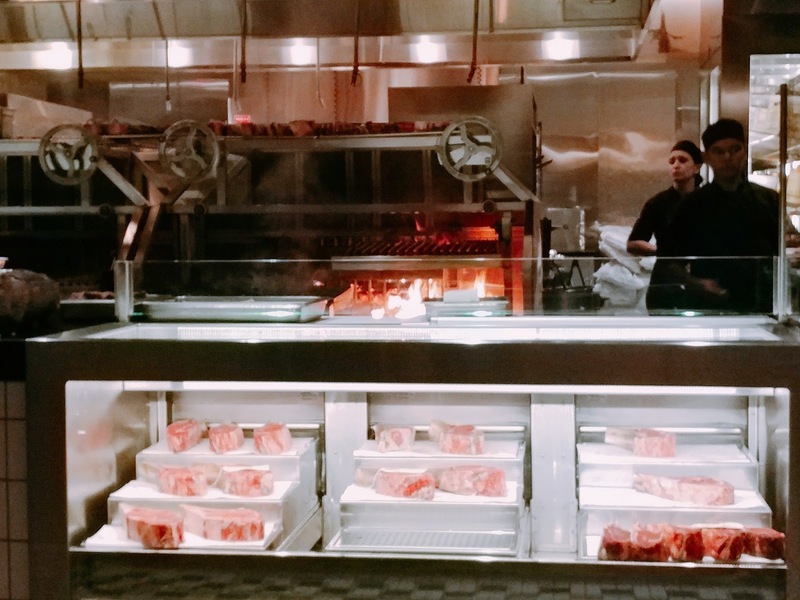 Bazaar Meat is a Jose Andres joint at the SLS, and this place is GORGE-OUS. It is also $$$$. And they will try to upsell you into $200 steaks, so hold firm to whatever it is you really want. $540 suckling pig, anyone? That said, it was the best meal of the trip, and you shouldn’t miss it if you want all of the whimsy Jose serves up in DC, with the added panache and magic you can only get in Vegas. First, kick off your evening with a cocktail I have covered on BHS before. 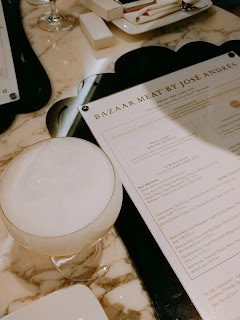 The salt foam margarita is a Andres classic, and though its price has now soared to $16, it’s worth it. 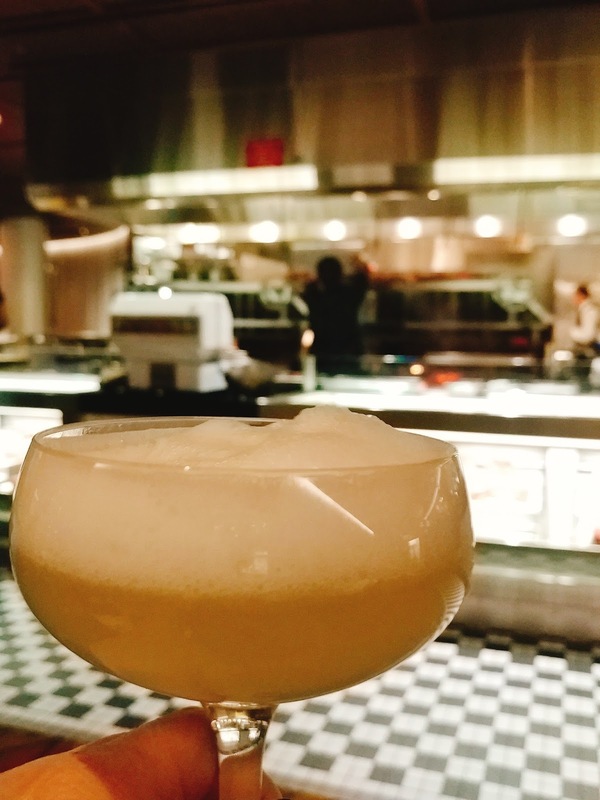 This is the most ethereal, refined margarita you will ever drink. Next up, get you some croquetas de jambon, or ham croquettes for my non-Spanish speakers. You may have had ham croquettes at other tapas restaurants, but I guarantee you’ve never had any fried food this wonderful grace your mouth. 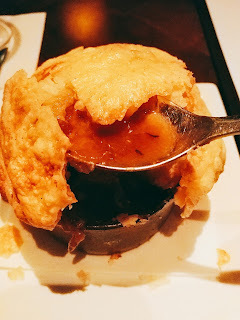 The inside was flowing with tiny cubes of salty, fine-textured ham in a savory béchamel sauce, while the outside was perfectly fried in a fragile breadcrumb coating. 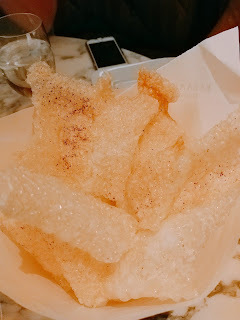 Super-giant pork skin chicarron? Yes, please. These actually ARE super-giant, and then when your waiter brings it to your table, he cracks it into manageable pieces with a hammer. Now THAT is entertainment I can get on board with. The cooling z’atar greek yogurt sauce that comes with these is worth the price of admission, alone. Romaine on ice was supposed to be salad. This is what came. OK. But seriously, the ranch dressing that came with it was so good, I didn’t care that I was expected to pick whole leaves of lettuce up with my hands and eat them. 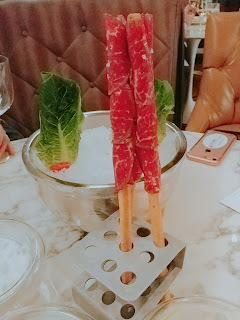 These bread sticks, or grissini, wrapped with raw steak were fine, and complimentary from the chef, but again, it was the dipping sauce that astounded us. It was a parmesan foam, and I would have eaten it off the corpse of any animal. It was creamy tasting, but lighter than any cheese sauce has a right to be. The texture was light as air, but the flavor had depth and salinity. Excellent. 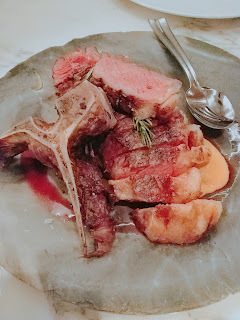 We split the $95 grass-fed, bone-in strip loin between the three of us, and it was the perfect amount of stunningly tender beef. Pricey, yes. Delicious, YASS. 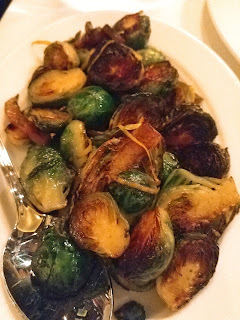 For sides, Brussels sprouts (again) and fried potato sticks. The sprouts had apricots and citrus and were exceedingly bright and light, which was a nice foil for all the richness going on in this meal. The potato sticks were flavored with malt vinegar, which isn’t my jam, but what can you do? My companions wanted fried potatoes, and these delivered on crunch and salt. This meal was expensive on the level of, like, you better win money gambling first. And like I said, our very cute waiter, Gerardo, did not wear a 'do rag, but did try to talk us into steaks costing hundreds of dollars. But that said, most of what we ate was absolutely wonderful; levels above anything you’re eating here in good old Binghamton, NY. 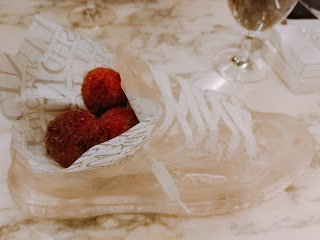 Jose Andres does not play, you guys. 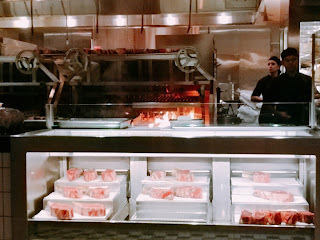 Eat at Bazaar Meat. The next evening, I saw Cirque du Soliel, which I know is terribly 2003 of me, but I have literally wanted to see it since 2003, so it was a bucket list thing. And it was awesome. But I was not about to actually eat food in Treasure Island, which is the Walmart of strip casinos, so I hot-footed it across the street to the Wynn. La Cave is a darkened jewel-box of a small wine bar inside this super fancy casino and resort, and I sat at the bar alone and ate two gorgeous little dishes you might want if a late night light bite is what you’re craving in LV. Crab ravioli were three tiny, perfect, bites of thin pasta enveloping sweet crabmeat in a lemon-butter sauce with grape tomatoes, and arugula. 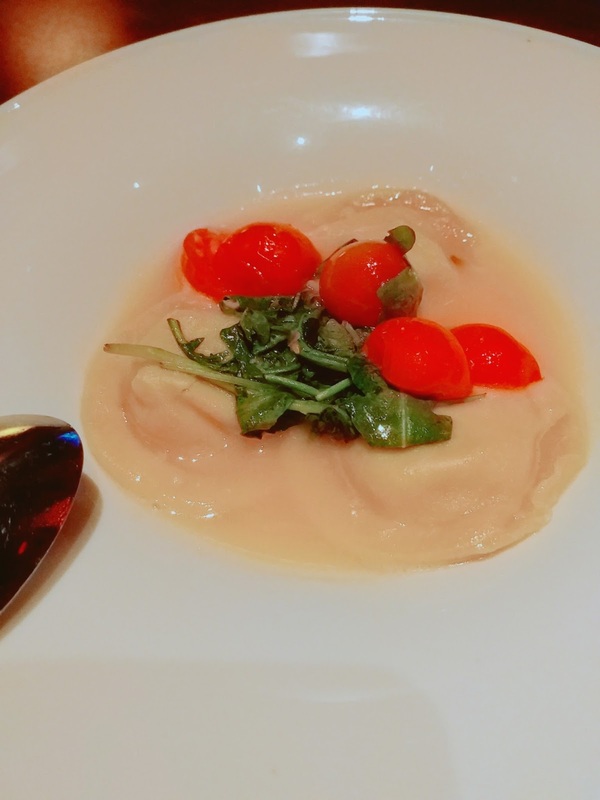 The peppery arugula and sweet tomatoes set off the acidic punch of the rich butter sauce really well, and the ravioli were so delicate, it was like eating clouds. French onion soup was a little more pedestrian, but still really tasty. Rather than a soup-soaked crouton topped with browned cheese, this tiny crock was crowned with a puff pastry sheet, and the Gruyere melted right into it, creating a seamless cheesy/crunchy dome over the savory soup that was fun to crack with my spoon. Because there wasn’t a mass of melted cheese oozing over the top, I missed the gooey factor I usually enjoy with onion soup, but that didn’t take away from the taste at all. The service here, even at the bar, was spot-on. My server was friendly and solicitous of my approval without giving me the hard sell on any menu items. He kept my water refilled, and let me order my two dishes one after the other without fussing that I was taking up a bar stool for too long. I would definitely dine here, or better yet, drink here, again. 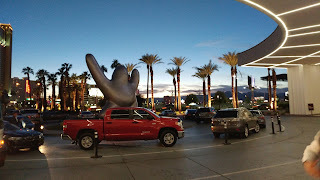 Because I was there for a trade show at the convention center, we stayed at the SpringHill Suites Marriott, which was one block off the strip, and I didn't mind that one bit. It was a bit less luxurious than many strip resorts, but also quiet and easy to get in and out of. The Ubers are also very good in Vegas, but beware, from any of the larger resorts, you will play a long game of go seek trying to find where the Hell they're allowed to pick you up. That game took me almost a half hour at the Wynn.